KP-1299A / KP-1299B - ONWA Marine Electronics Co. Ltd. Note:From time to time, ONWA introduces new features and finds ways on how to improve the functions of your GPS Plotters. This firmware update will improve the performance of your GPS Plotter. Please read the following instructions carefully before doing the firmware update. Note 2:The latest firmware Update will erase all your saved data such as waypoints, tracks, routes, etc. REMEMBER to back up all your files by inserting a blank SD card in the Plotter and then select Main Menu->Data->Data out. A) It is advised to switch off the unit when changing the C-MAP card. B) It is advised to save all user data (waypoint, route etc.) before upgrade by copying them into a SD card. Go to MAIN MENU-> Data -> Data out. After upgrade you can copy them back to the unit. Go to MAIN MENU-> Data -> Data in. Please switch “ON” the AIS screen after upgrade, MAIN MENU->Setup->AIS screen->”ON”. Please turn “ON” AIS TX after upgrade, MENU-AIS->AIS TX-> “ON”. Please check the own ship MMSI on the first row of AIS detial list, MENU-AIS->AIS detail list. If the MMSI is all “0” please re-enter the MMSI from AIS SET UP screen. i. Switch off the unit. ii. Switch on the unit again. iii. Press and hold [MENU] + [ESC] at the same time when you see the WARNING page. iv. Then enter the AIS SET UP screen, choose “READ” to read the AIS data. v. If the “Read fail! Try again” message appears, please change AIS model to “2” and choose “READ” again to read AIS data. You can also study this link from youtube for detail : http://youtu.be/ievl784z6HM. *Please read the instruction carefully before update. **The update action is not reversible. ***For KPXX99A/B please turn on AIS screen in SETUP menu. How will I know if my KP-1299, or any other KP-XX99 Plotter series, is updated or not? A: The latest firmware version available for our GPS Plotters is 16.06.14. Compare this to the firmware version of your GPS Plotter to know if it is updated or not. How will I know the version of my GPS Plotter? A: After turning your GPS Plotter “ON”, a window will be displayed containing a warning message about C-Map and K-Chart Electronic Charting Systems. On the bottom-left side of the window, the Software version of the unit will be displayed and on the bottom-right side of the window, the K-Chart version of the unit will be displayed. A: Automatic Identification System (AIS) is a reporting system used in the identification of marine vessels and its location. Vessels equipped with this system allow each other to communicate automatically, dynamically and regularly update their position, speed, course and information such as vessel identity. 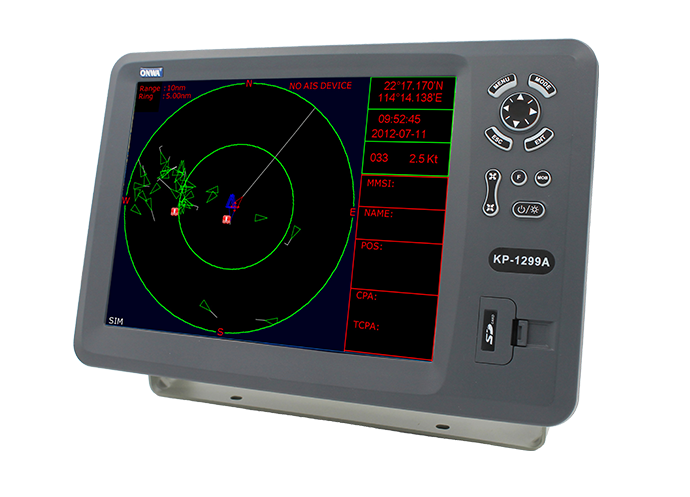 The AIS radar function does not refer to its own AIS system and its features such as the VHF T/R and Letter Machine but by serial interface through (NMEA) which will be received by the AIS and sent to the radar on a real time displayed on the radar screen. 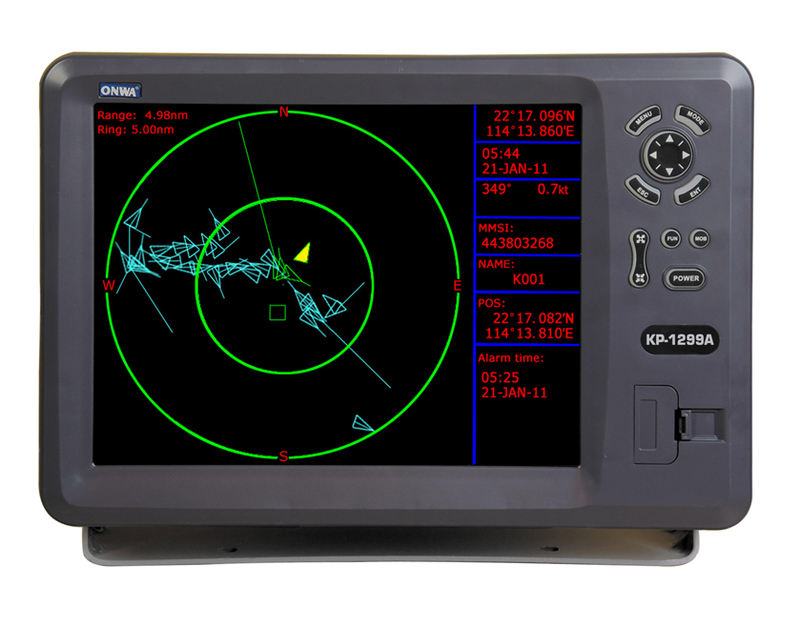 ONWA Marine Electronics offer Chart Plotters with built-in AIS devices or external AIS devices which can be interfaced with your Radar and GPS Chart Plotters. Why is the AIS screen missing after the installation of the new firmware? A : Starting from the new firmware update, we put the AIS screen “ON”/”OFF” selection in the SETUP menu. The default setting for the AIS screen is “OFF” therefore, you need to turn the AIS screen “ON” in the SETUP menu. How to install or update new firmware? How to switch “OFF” the unit if the system hangs in some cases? A : Press and hold [POWER] key for about 10 seconds, then the unit will turn “OFF”. What is the difference between an Automatic Identification System (AIS) transponder and an Automatic Identification System (AIS) receiver? A: There are two classes of Automatic Identification System (AIS) devices: Class “A” Transponder and Class “B” Receiver. Class “A” transponders are those with built-in VHF transmitter and receiver. This means that the device can transmit and receive vessel information to and from its own vessel. On the other hand, Class “B” receivers are only able to receive vessel information from other vessels which has AIS transmitters. What is the range Automatic Identification System (AIS) covers? A: Normally, vessels with an Automatic Identification System (AIS) receiver connected to an external antenna placed on 15 meters above sea level, will receive AIS information within a range of 15-20 nautical miles. Even behind remote mountains, range can be determined depending on the elevation, antenna type, obstacles around antenna and weather conditions. Can I use the Automatic Identification System (AIS) of ONWA with other brands? A: Yes. ONWA Marine Electronic equipment uses NMEA standards which makes it compatible with other brands. You can use the included cable (KS2-data1) on the package to connect the Automatic Identification System (AIS) device to other navigational equipment such as plotter, radar etc. Please connect the DB9 connector of the KS2-data1 cable to the DB9 socket of KS200A/B. Connect the other end of the KS2-data1 cable to the external navigational equipment. Wiring Connection is available in the manual. Why is it that I cannot see the ship nearby in the Automatic Identification System (AIS) screen, though I see it on the sea? A: There are two classes of Automatic Identification System (AIS) devices: Class “A” Transponder and Class “B” Receiver. Class “A” transponders are those with built-in VHF transmitter and receiver. This means that the device can transmit and receive vessel information to and from its own vessel. On the other hand, Class “B” receivers are only able to receive vessel information from other vessels which has AIS transmitters. Thus, vessels with Class “B” AIS devices cannot be seen by other vessels, it can only receive information from other AIS devices. Another scenario would be if the other vessel has no AIS device at all. Then, only the radar can detect its presence on navigational equipment. Can I see my ship in marinetraffic.com using the Automatic Identification System (AIS) of ONWA? I lost the adapter of my Radar for Automatic Identification System (AIS), how can I get a new one? A: Please contact your nearest ONWA Dealer or you can send us an email about your concern on Automatic Identification System (AIS) via our Contact Us page.